Organizations must be a recognized charity with a feeding program serving the needy, ill and infants. Organizations must be a 501 (c) 3 not-for-profit, tax exempt organization, with a determination letter from IRS, an accredited church or be part of a nutrition, education or service program operated by the city, county or state. There must be a need for your program in the area you serve (to avoid duplication of effort). The food program must not discriminate on the basis of race, religion or creed and cannot require individuals to participate in ecumenical or educational services as a requirement for receiving food. The organization must have appropriate physical capacity to receive and distribute food (all sites will be reviewed by Foodbank staff). The organization must have adequate staff and/or volunteers to support their feeding program and identify a key staff member/volunteer to serve as primary contact for the program. The organization must have a defined method/systems for how food will be distributed. Food program must operate for at least 3 months prior to applying for partnership. Food pantries must keep written record of grocery distributions that include customer’s name, address, date of service and number of people in household. Food pantries and soup kitchens must have regular hours of operation, established procedures, rules and regulations under which the program operates. Food program must distribute food/meals at least once a month. Once you determine your organization meets the above requirements, click here to submit an online application. All applications are reviewed within 15 business days from date of submission. Once an application is reviewed, Foodbank staff will contact the organization to arrange a site visit. After an initial site visit, organization will be notified within 30 days if they are eligible to become a Foodbank partner. Once an organization completes required trainings and orientation, they will be given a partnership agreement. Partnership agreement must be completed and returned within 30 days. 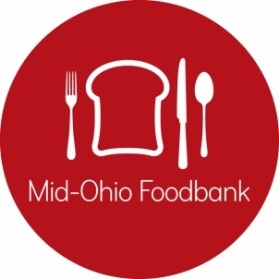 Once the partnership agreement is signed and returned, organizations are officially recognized as partner agencies and are eligible to access food from Mid-Ohio Foodbank.